National Health Blog Post Month, Day 14: Elevator blog. If you were in an elevator with someone and they asked you about your blog, what would you tell them? My blog is my perspective on living with diabetes, including random nonsense, diabetes-related acronyms, and as much humor and entertainment as I can muster. The goal is to help people with diabetes fill in the gaps between the clinical and the unknown, encourage a sense of community, and make sure that no one ever feels alone with diabetes. 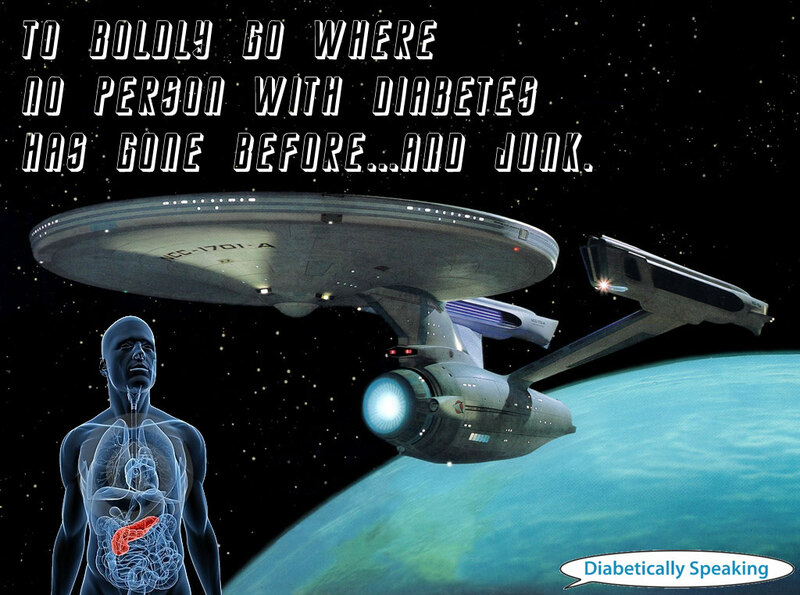 And to boldly go where no person with diabetes has gone before. Today, November 14, is also World Diabetes Day. Landmarks around the world are being lit blue tonight to honor people with diabetes and to help raise diabetes awareness. Join me in wearing blue today, take someone with you to a World Diabetes Day event, and help show the world that despite the challenges of living life with diabetes, people are able to thrive with this disease when they have access to proper medications and treatments. Insulin is a blessing to all of us with diabetes who need it to stay alive, and we are immensely grateful for it, but it is not a cure. WE NEED A CURE!